We had so much fun at the 2015 Chattanooga CityTrail 30K back in September, we decided to come back up to Chattanooga to run another Wild Trails event – the Lookout Mountain 50-miler and 10K Trail Race on Saturday, December 19, 2015. 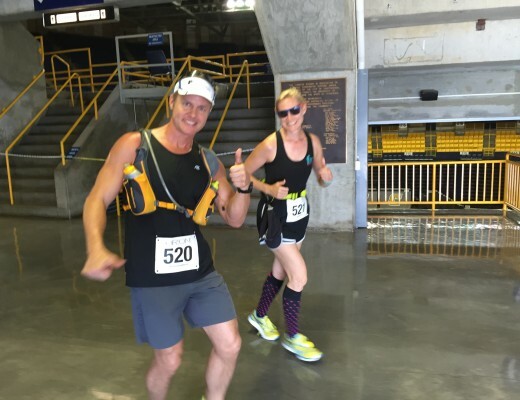 Perhaps someday we’ll have our endurance built up enough to do the full 50-miler, but this time we were content to run the 10K option. 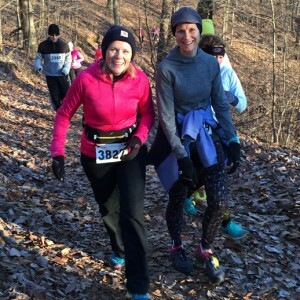 In short, it was a fun, scenic 10K entirely appropriate for both beginning and advanced trail runner. 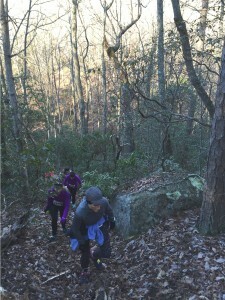 The Lookout Mountain 50-miler and 10K Trail Race start and finish at Covenant College, atop Lookout Mountain. 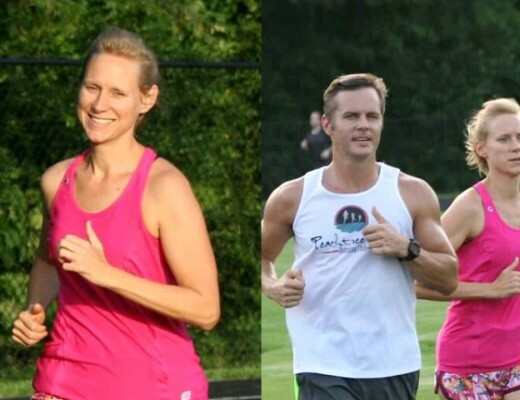 The 50-mile race started at 7:30 a.m. (Eastern Time) and the 10K started at 8:00 a.m. Both races feature the typical race premiums: a nice t-shirt, goodie bag, refreshments, and age group awards – but the main attraction is the course. 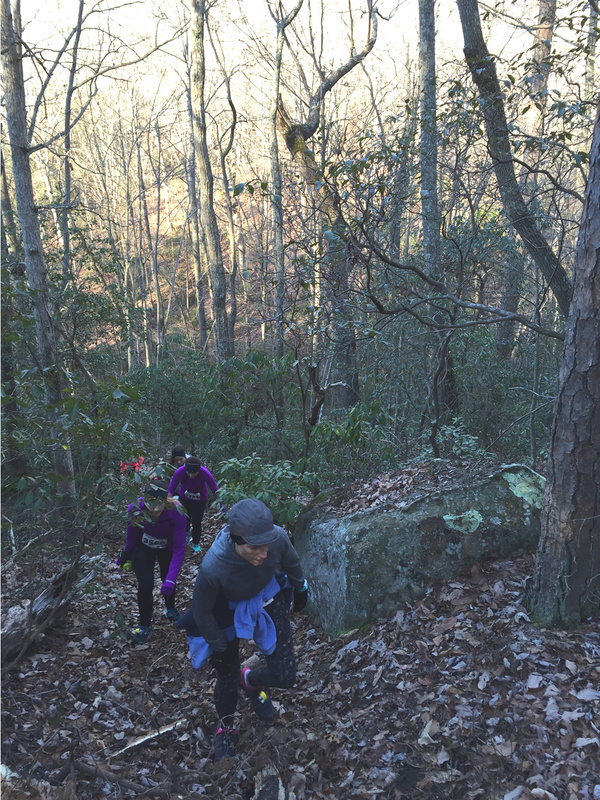 Each race features a challenging, yet beautiful natural setting along, down, and up the Lookout Mountain plateau. We’ll focus on the 10K race in this report since that’s what we ran. We were able to leave our house at 4:45 a.m. just south of Atlanta and make it to the race start around 7:00 a.m. Chattanooga is an easy drive up I-75 from Atlanta (unless there’s traffic or an accident). The past week it had been unseasonably warm, so naturally things cooled off for race weekend (but it didn’t rain!). It was a cold 26 degrees up on the mountain, but the lack of wind made it more bearable. I don’t know about you, but we don’t mind the cold as much as the wind. Parking was near the Covenant College activity fields with a short walk down the road and across the street over to the race registration area. Check-in was easy & pain-free. The race was electronically timed, so we received timing strips to put in our shoe laces, a race number, t-shirt, and goodie bag. They even had a fire pit going to keep runners and volunteers warm. Promptly at 7:30 a.m., the 50-milers set off on their all-day journey. 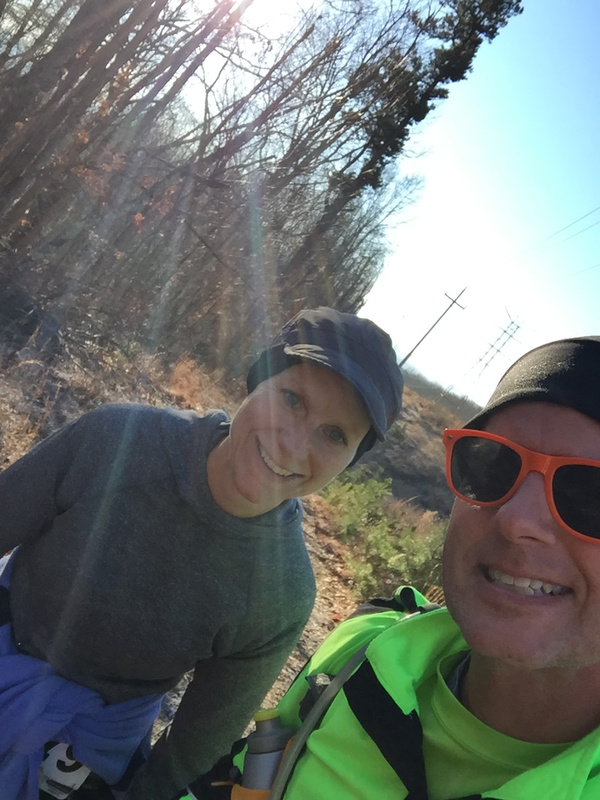 We met up with one of our friends, Coleen Pruitt and her running group. Coleen and her husband Stewart used to live nearby but moved to Chattanooga a few years ago. It’s always fun seeing friends at races. The race starts out with a short half-lap around the activity field in order to give the runners some elbow room to spread out. 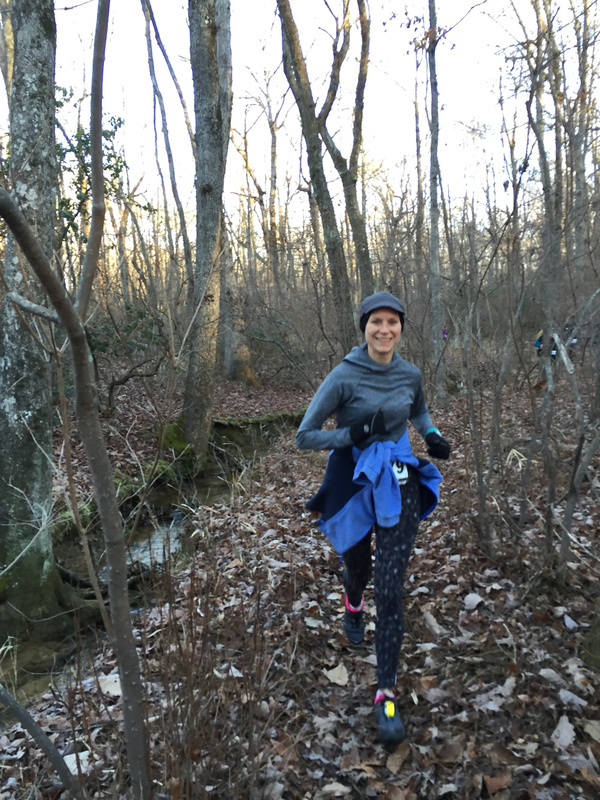 In fact, the first two and a half miles featured mostly double-track trail (some of which appeared to be an old road bed) which gave us plenty of room to settle in with the other runners and spread out before the single-track trail sections. After the half-lap around the fields, we headed in a southerly direction. The main image at the top of this article was the sunrise off to the east just above Mary Catherine. It was a gorgeous way to wake-up with the sun. We really liked the fact that the course started off relatively flat and non-technical. The entire course was extremely well-marked with small yellow Wild Trails flags and volunteers at key turns. During this early part of the race, Coleen ran with us and we enjoyed talking with her and other runners along this easy part of the course. 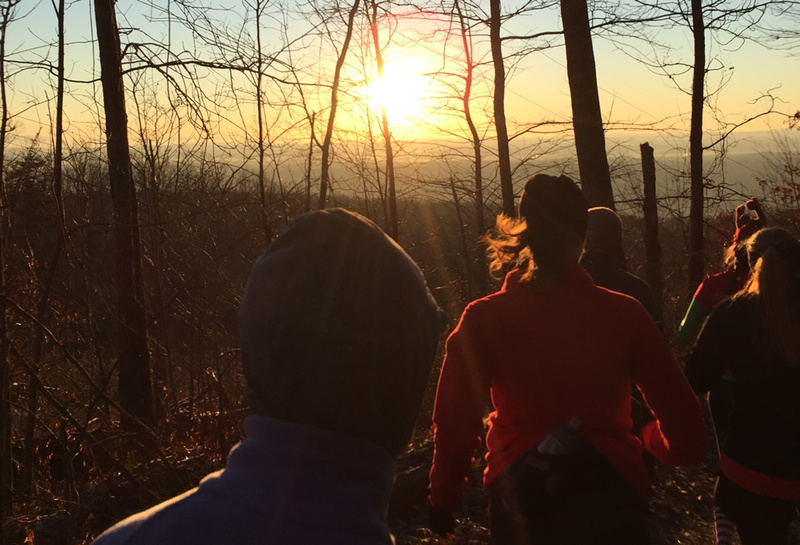 The sun was our constant companion for the first mile as we ran along the east side of the ridge. Frankly, it’s hard to find a better spot to be than on top of a mountain watching the sun rise on a cool winter morning. 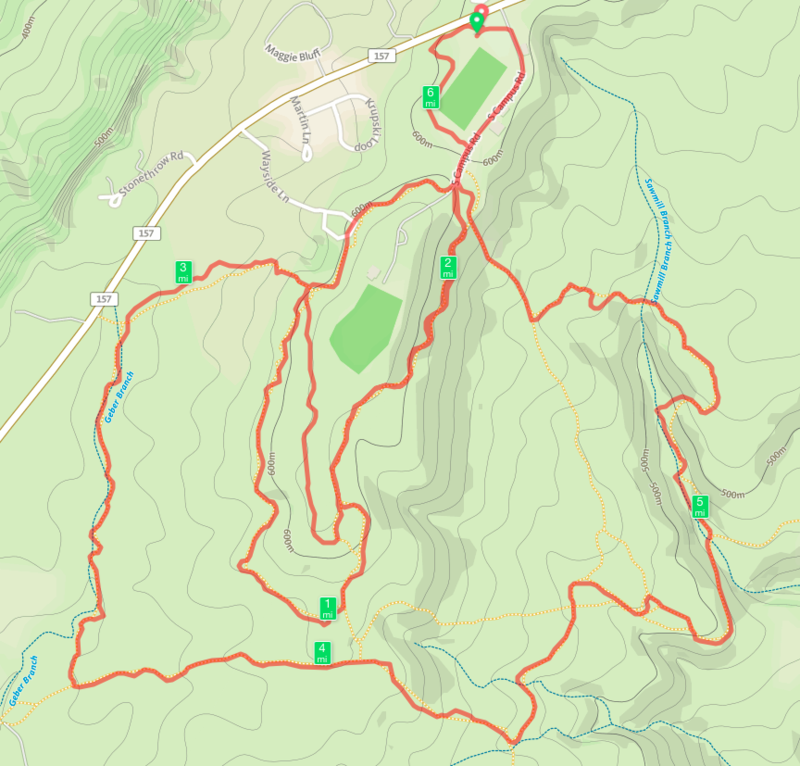 Near the one mile mark, the course rounded the southern tip of the hilltop and went north on the west side to start what would be almost two laps around the hilltop. The second mile along the west side had a bit more of an incline but was still relatively flat and easy. The first and only rest stop was at the north end of the hilltop near mile two. At this point we were properly warmed up and decided to shed a layer of clothing. Mary Catherine tied her jacket around her waist and I tucked mine into the hydration pack. The third mile was almost a repeat of the first mile as it veered south again on the east side of the hilltop. Hello again, sunrise! About half-way along the ridge, the course had a slightly different itinerary around the tip of the hilltop and onto the west side again. About a quarter-mile later, we took a trail to the west and made a steep descent down and to the west towards Geber Branch (stream). Mile three of the course began around half-way down the descent to the stream. When you’re running in the mountains and you’re near water, there’s bound to be some mud and this course was no exception. It’s hard for wet areas to dry out in ravines and low-lying areas. Even though there was mud, we found plenty of mostly dry side areas to avoid getting bogged down. The mud doesn’t deter Mary Catherine. She’s in her “happy place” out on the trails. Check out this picture for proof! A little over a half mile of running along Geber Branch and the course pops out onto a rocky, dirt road underneath power lines. The route heads sharply to the east again and features a short climb towards mile four, which sits almost directly below the first mile just a little ways up the hill to our north. 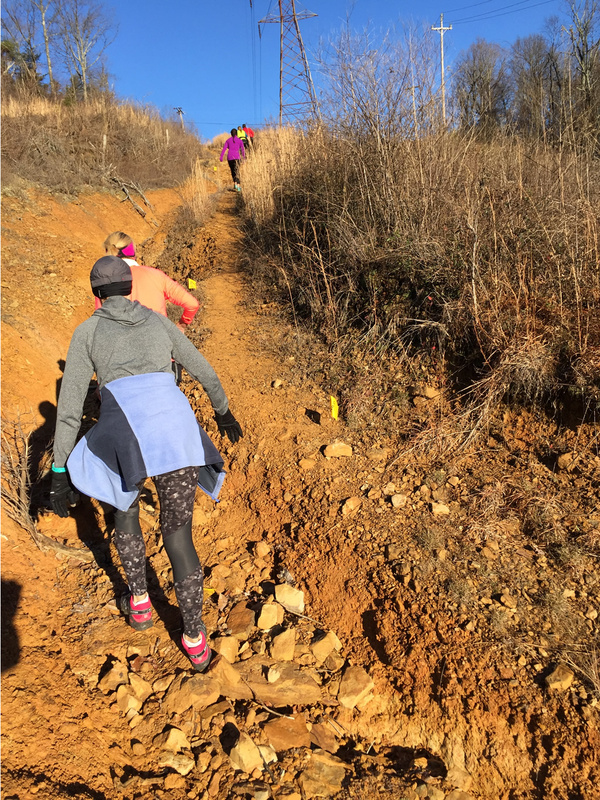 The section along the power line cut was just a foreshadowing of tougher, steeper climbs ahead of us! 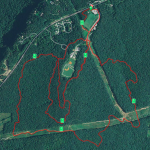 After cresting a high point, the course went in a southeasterly direction back into the woods. 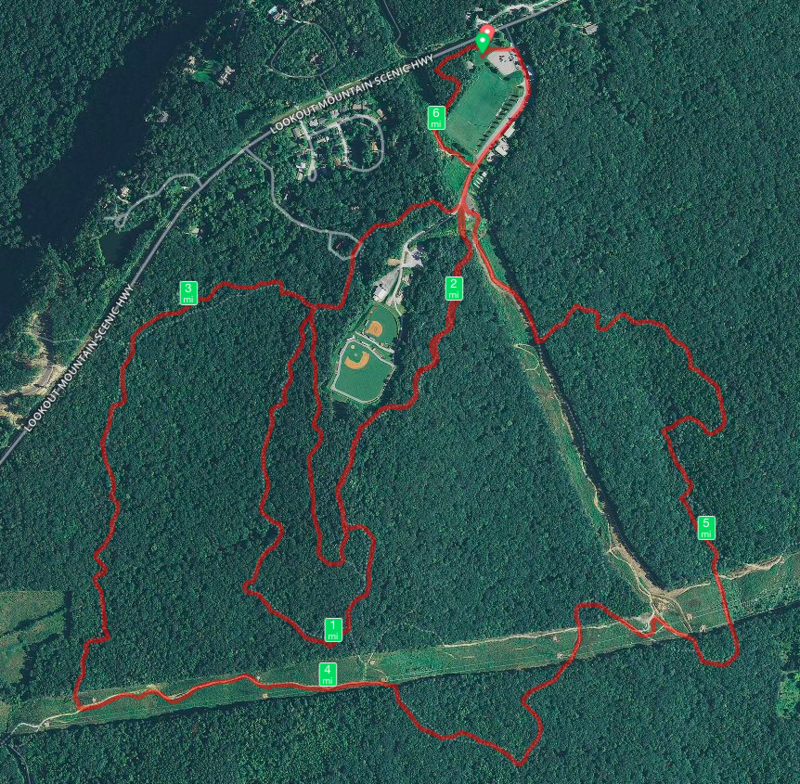 The course continued a mostly descending route with a few zigzags out of the woods, across the power line cut and back into the woods again. Along the way, we met the water again, this time flowing streams. 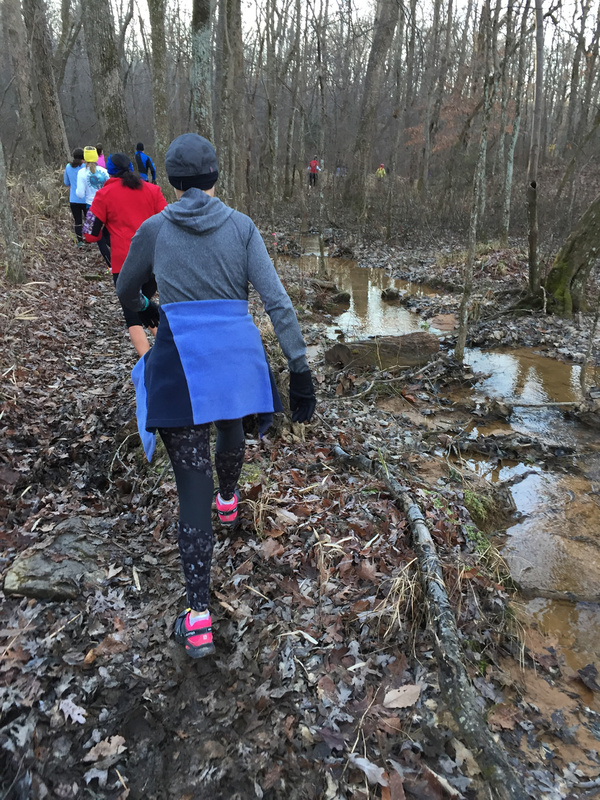 If you’ve read out previous race reports, you know that we love running through water crossings on trail runs. 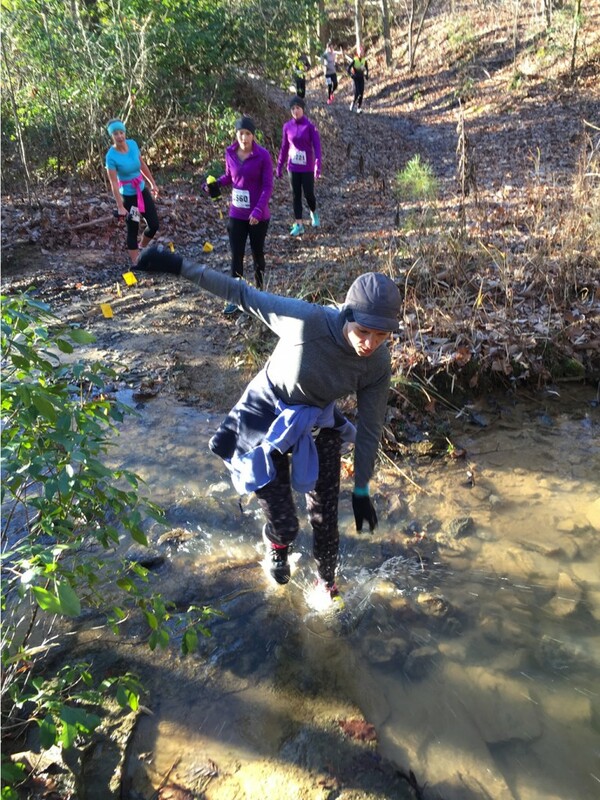 Mary Catherine navigates the water crossing with grace and elegance with our new running friends watching how it’s done. 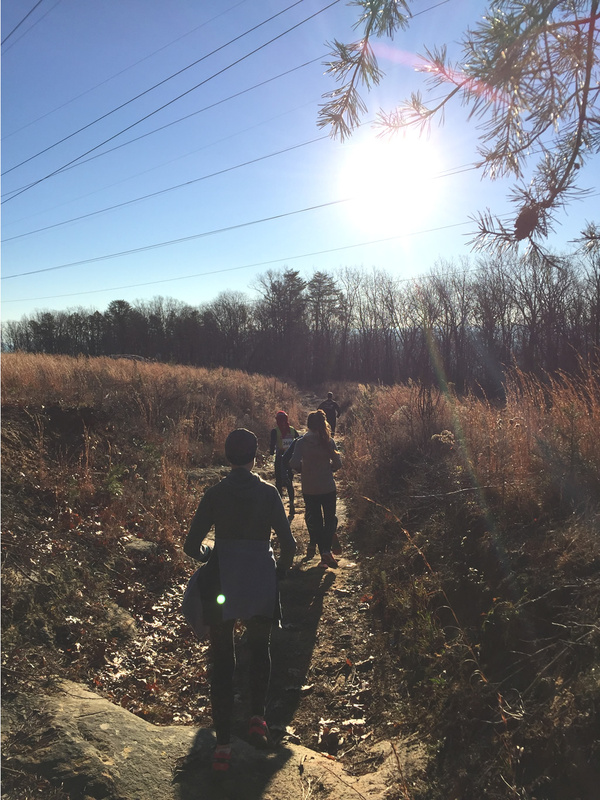 Joe, MC, Morgan, Ashley, and Kassaundra and friends having fun on the trail. Yes, the water was cold! With proper footgear and socks, water crossings aren’t a big deal – they’re just fun. My biggest challenge is trying not drop my iPhone while taking these fun pictures! So far, so good… if you ever hear me cry on the trail it’s probably because I dropped my iPhone in the water. 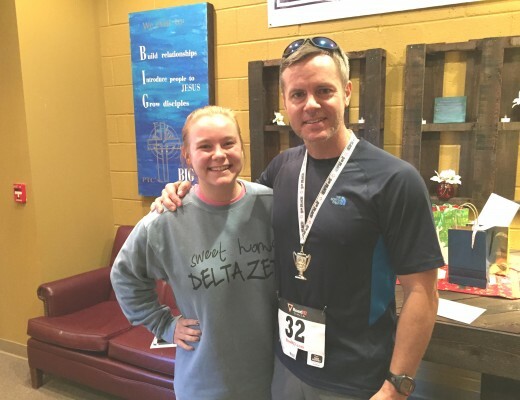 Along the way (and especially at trail runs), it’s always fun to meet up with nice people. They usually see me taking pictures and we tell them about our MarriedRunners.com blog. Sometimes we can get people to pose in some of our pictures. 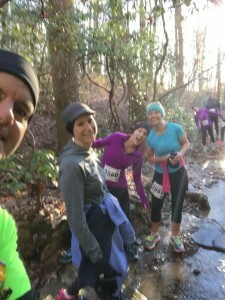 Over on the right (click for a larger image), that’s me, Mary Catherine, Morgan Cantu (3560, in purple), Ashley Cardwell (3561, in teal), and Kassaundra Kirschmann (3721, in purple) who enjoyed running through the water crossings with us. Sorry the picture is a little blurry, but y’all look great girls and thanks for joining in the fun! At about the 4.75 mile mark, the course headed north back across the power line cut and into the woods heading across and along Sawmill Branch. The first crossing of Sawmill Branch, pictured below, marked the end of the easy fifth mile and began the epic, upward climb to the top. The toughest section of the course was the final 1.4 miles and so I thought it deserved it’s own section in this race report. After the Sawmill Branch crossing, pictured above, we began a sharp ascent in the woods generally alongside (and sometimes a few easy hops across) Sawmill Branch. 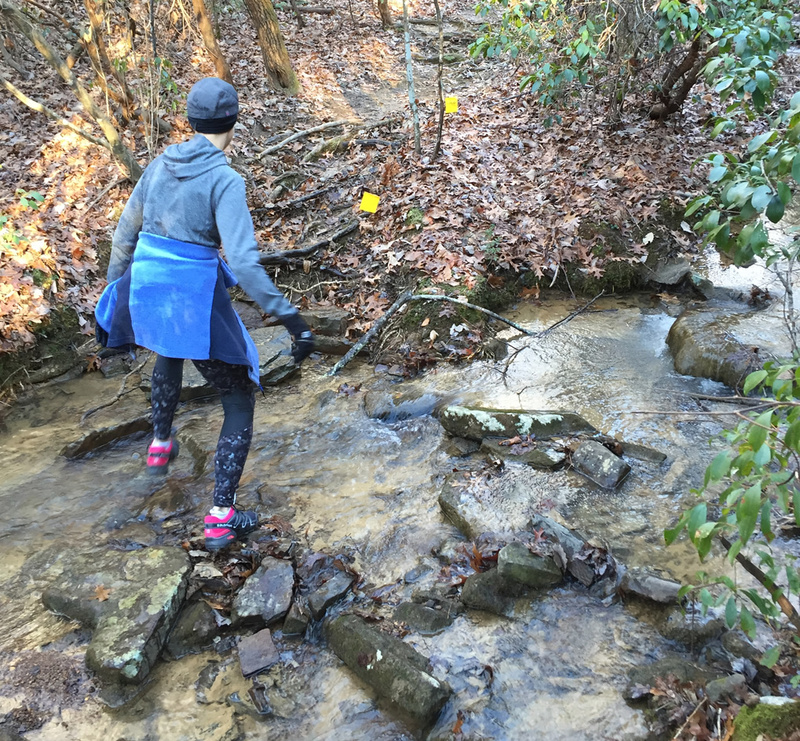 One thing to keep in mind about running in the mountains is that, generally speaking, creeks and streams are generally easier to cross as you head up in elevation and harder (as water flows downhill and gains momentum) down in low areas. As we finished the final mile, our concern wasn’t water, it was elevation gain! The picture on the right (click to expand it) helps provide perspective on how steep the course was – it was pretty much a hand and foot scramble up the mountain. It’s hard and, frankly, not very practical to run sections that are this steep. We both enjoyed the challenge. This short, but steep section also featured the only part of the course with large boulders and rocks, which we found quite scenic. The climb wasn’t technical – just steep. At about the 5.5 mile mark, we crossed Sawmill Branch one more time before heading back into the power line cut and a sharp, steep climb directly north to the finish. Knowing that we only had another half-mile to go, we put on our happy faces (see smiling picture to the left). I’m not sure what’s worse – a long climb in the woods where you can’t see the top or one out in the open where you can see what you’re facing. Well, this 10K course had both. We had just climbed through the woods and boulders without seeing the top. Now we were back in an open area, where there was no hiding from the incline. In fact, Race Director Randy Wharton positioned himself along this section of the course to watch our suffering! (Just kidding, Randy – we know you were there to cheer us on). Here’s another picture to put this final climb into perspective, as Mary Catherine makes her final ascent to the top of Lookout Mountain. After cresting the top, the course crossed S. Campus Road (where the aid station was earlier near mile 2) and around the activity fields to the finish line. We could hear the finish line before seeing it. That was a relief because (like many mountain races) my GPS, Mary Catherine’s GPS, and my RunKeeper all had slightly different distance values. 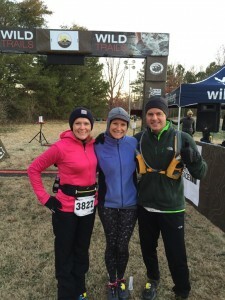 The consensus was that the course was accurately marked as a 10K. Here’s the scene as we rounded the corner and approached the finish line. 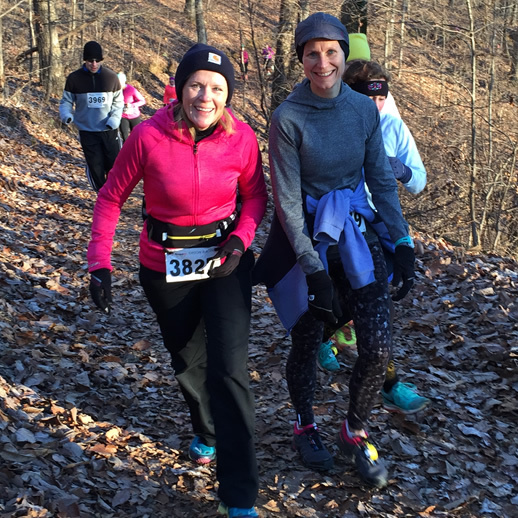 We were very pleased to finish the 10K course in 1:24 – stopping to take pictures, enjoy the scenery, and spend time in the great outdoors. Coleen wasn’t too far behind us so we waited at the finish line to see her cross and take a few more pictures. What a great course on a beautiful morning! Of course, no trip to Chattanooga is complete without some shopping and dining. After saying goodbye to new and old friends, we got back to our car and headed down the mountain into the city to enjoy a tasty breakfast at Maple Street Biscuit Company. Next, it was across the river to the North Shore for Christmas shopping for the kids (and ourselves) at Rock/Creek and other stores. We enjoyed a healthy lunch at Cashew Plant-based Vegan Cafe (one of MC’s favorites), followed by a box of donuts (you know my love of donuts) from Julie Darling’s Donuts. Then we hopped in the car for the two-hour ride home. What a great day! 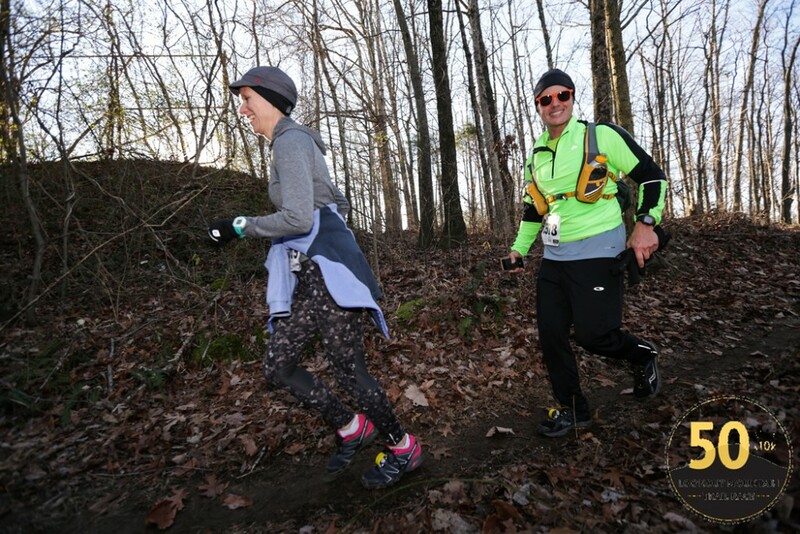 In summary, we really enjoyed the race and are giving serious consideration to train up for the 50-miler (which is even more scenic). 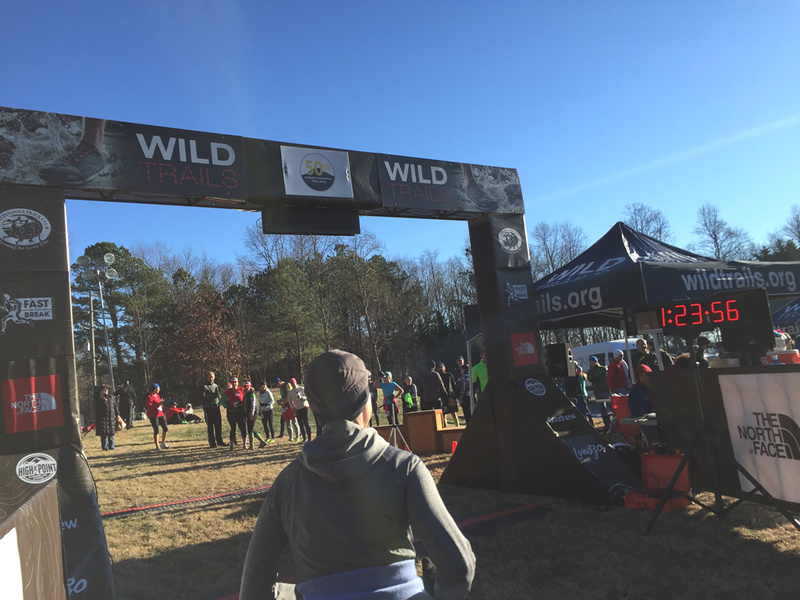 Wild Trails puts on great events in great locations. 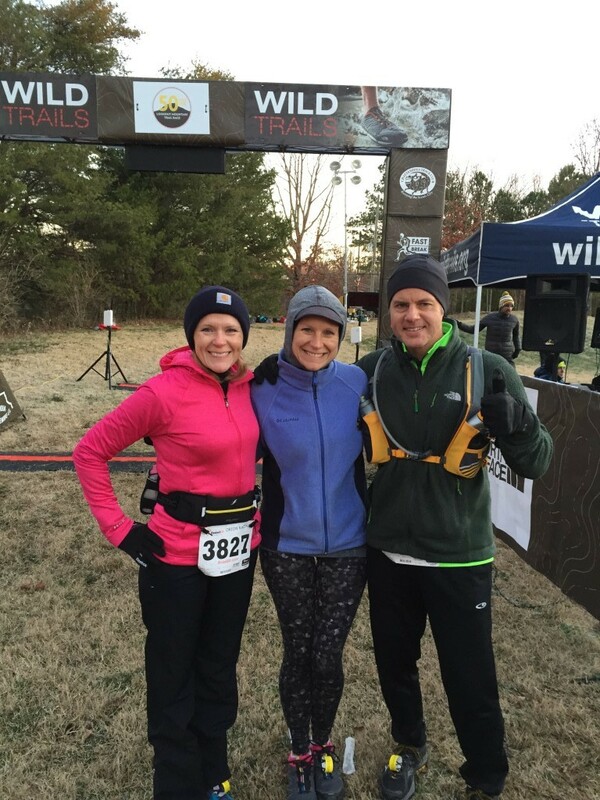 The 10K course had it all: flats, climbs, water crossings, rock scrambles, nice vistas, and a scenic sunrise. I’d be hard-pressed to name another 10K that has so many natural features. 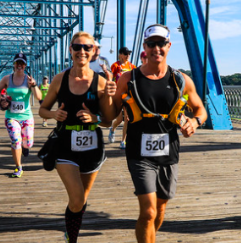 Whether you’re new to trail running (like we are) or a seasoned veteran looking to compete – this is a great race in a cool town. Maybe we’ll see you there next year?